When you arrive at 777livecams.com, your initial reaction is to feel like you have landed in some sort of gambling game site. The color of red and the specific font choice lettering; the overall design gives the sensation of a casino where you are likely to win or score. However, unlike a lot of live cam sites, you do not get much for free with this one and you are required to pay in order to reveal the shows that you wish to see. Here, you find all the cams that are available and each amateur has a star rating, a selection of options, their picture and a catchphrase to try and entice you. There are a number of categories spread across the top for you to choose from - different ethnicities, ages, genders - or you can specifically modify your search by finding this option next to the language selection. Down to the left hand side of the screen, you will see that this site is user friendly and allows you the option to login quickly by using Facebook. If you prefer not to or you do not have a Facebook account, you can register quickly by clicking the orange button above reading ‘Register.’. This way of registering is also quick and easy - you simply need to pick a username and enter your email address! After successfully handing over these details, you are requested to quickly check your email as to make confirmation. However, you must be sure to check you ‘SPAM’ folder as mail like this sometimes ends up in there. Once you have found the email, within the message you will find your password for future logins and a link that allows you to confirm your details. This link then redirects you back to the site, where you are granted a one off chance to grab the special offer which is unique for new members. The reward is limited to a ten minute time frame, so you need to act fast! This is a great deal, when you are expected to pay over double for a minimum of 525 coins in the future and considering that you do not get far without coins when using this site, you are encouraged to grab this opportunity! If you do miss this opportunity, you will be required to pay full price for coins and will need to select the option on the top left of the screen to start the purchase. 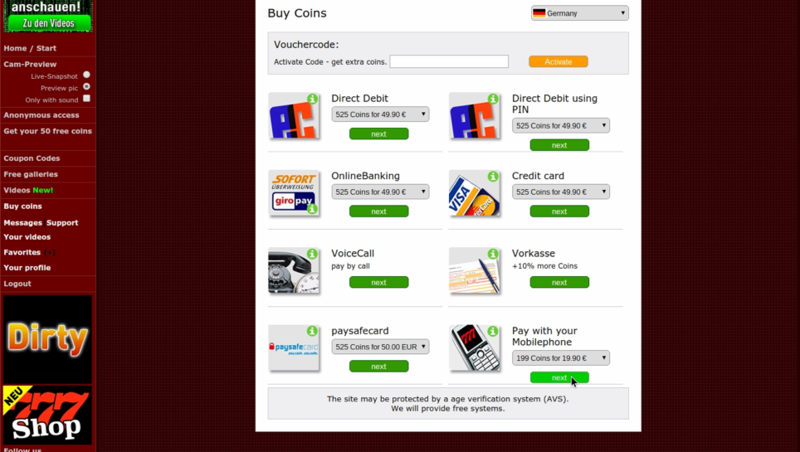 It is easy to buy coins and if you would like access to the majority of the site including ‘SexChat’. If you do not have coins then you are extremely restricted and do not get to spend any quality time viewing or getting to know any of the beautiful models who are online. Because the site is German, you are instantly taken to the list of available options to make payment if you are in this country. There are many different ways to secure a transaction, including credit cards, paying via your mobile phone and more! If you wish to select your country of residence, then you will need to choose from the drop down box provided at the top right. Be aware that you will not have as many options if you are in a different country. The minimum amount of coins that you may purchase is 525 coins and for this you will pay €49.90. By selecting a model from the home screen, you will be directed to his / her page where you can take a look at their profile and what he / she has to say about themselves i.e their description, hobbies etc and what the charge is per minute to enter their show. Most models charge a rate of 15 coins per minute, (which means if you only buy 525 coins then you will enter for a maximum of 35 minutes). Sending a private message to someone who tickles your fancy is another feature which requires payment and so, if you do not have enough coins a message will appear reminding you to refill. That being said, you may receive free access the some of the images that the model could have provided. As a registered user, you are granted access to the free galleries that some of the users provide, so you are able to browse and check out the amateurs that are performing on the site. Otherwise, at the left hand side of the screen you will also see that there is a ‘Free galleries’ selection and once you have chosen this you will be provided with all of the latest pictures which you may view. If you have a phone with a dial code within the country selection (mainly european countries), then you may receive 50 free credits by entering this information and acquiring a code which is sent not you via text. Across the top you have the ability to modify which categories you prefer. Each video has an image so you get a feel for what it entails, there is also a rating, caption and price. Upon selecting the video of your choice, you will find a full short description of the video and once you have made a purchase, each video you buy will be added to the ‘Your videos’ list so as to keep. Overall, this site ensures that all models benefit for their work and so out of respect, nothing much is given away for free. Before entering the 777livecams.com, you must be aware that if you do wish to view any live cams, then you are going to need to purchase coins.